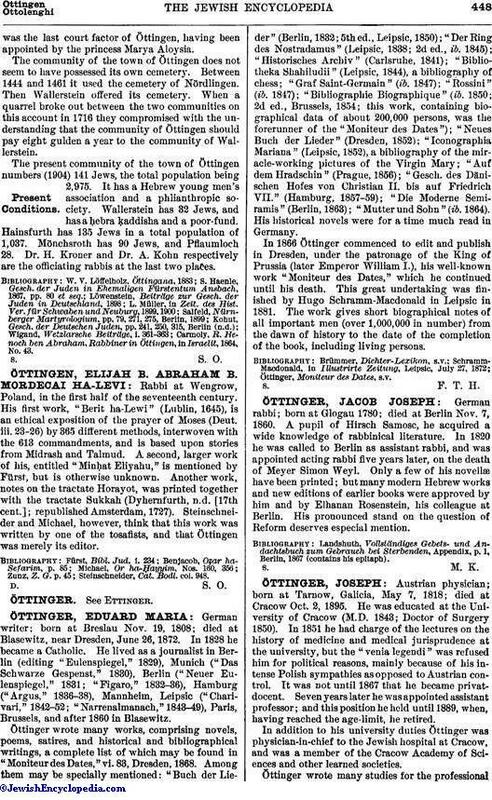 German rabbi; born at Glogau 1780; died at Berlin Nov. 7, 1860. A pupil of Hirsch Samose, he acquired a wide knowledge of rabbinical literature. In 1820 he was called to Berlin as assistant rabbi, and was appointed acting rabbi five years later, on the death of Meyer Simon Weyl. Only a few of his novellæ have been printed; but many modern Hebrew works and new editions of earlier books were approved by him and by Elhanan Rosenstein, his colleague at Berlin. His pronounced stand on the question of Reform deserves especial mention. Landshuth, Vollständiges Gebets- und Andachtsbuch zum Gebrauch bei Sterbenden, Appendix, p. 1, Berlin, 1867 (contains his epitaph).